Late In 1941, Toshiaki (Jack) Goto took possession of his new gill netter – the last one built by the Suzuki Brothers Boat Works on Annacis Island. When he and his family were ordered relocated in 1942 his Finnish neighbor, Frans Jakko (Jack) Taipalus, bought the new boat from him for $2,500 with the promise that it would be handed back at the same price when he returned. The boat was then renamed the “Deanna”, the sign painter’s interpretation of how Jack Taipalus pronounced the name of his daughter Diana. When Goto returned to River Road in 1950, Jack Taipalus offered the boat back at the promised price but Goto said he had decided to build a new one and commissioned the building of the “Golden Girl”. 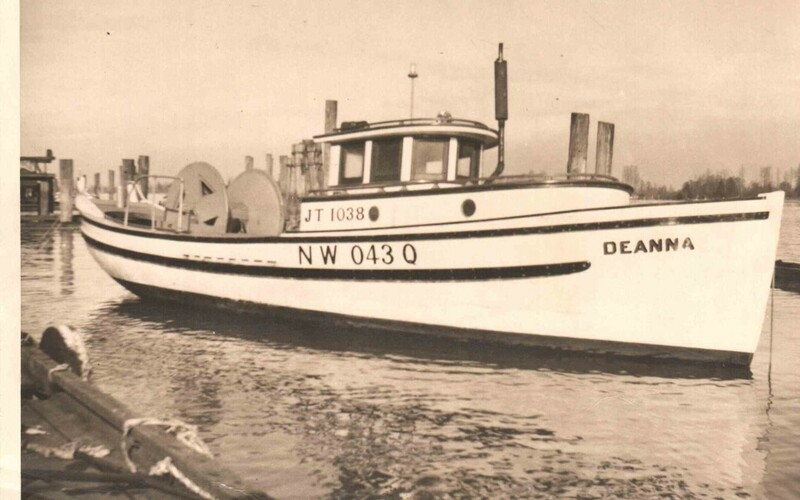 Taipalus then let him use the Deanna for the 1950 and 1951 seasons until the new boat was ready. Frans Jakko (Jack) Taipalus (1889 – 1973) was born in Finland, emigrated to the USA and then Canada. He married another immigrant from Finland, Martta (Martha) Taipalus, (1906 – 1997) in 1929. Their son George was born in Sioux Lookout Ontario and their daughter Diana in Flin Flon Manitoba, where the family operated a dairy. In 1939 they moved to British Columbia purchasing a dairy farm on River Road in Ladner, near the Gotos’. They farmed (and fished) until retirement in 1965. After high school in Ladner, Diana went to UBC for her Home Economics degree. She took up her first teaching job at Howe Sound Secondary School in Squamish, where she met Gerry Kristianson when he returned home from UBC to work during the summer of 1960. They were married in the summer of 1961. Story and image kindly provided by Gerry and Diana and their son Eric Kristianson. This is a great story of a shameful time in our history I wonder if there are more like it. My parents told me about Mrs. Hatashita coming by boat to our home in Egmont to ask if they could pay their store bill as the Japanese Canadians were being deported/interned within 24 hours. My parents paid in full as did other decent folks. But alas many did not. Thank you for the comment about the fishing boat and reference to your family story. We would love to connect with you and find out more about your parent’s store and their experiences with Japanese Canadians before the internment. Would it be possible to use above story in Our “West Coast News”, which is published here in Vancouver, BC.